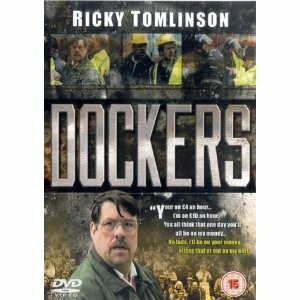 Feature-length drama depicting the struggles of a small group of Liverpool dockers. Written by working dockers, with the help of screenwriter Jimmy McGovern and novelist Irvine Welsh. Dockers is a landmark one-off drama suspended somewhere between Ken Loach and Alan Bleasdale's Boys from the Blackstuff. A striking Channel Four production Dockers dramatises the infamous struggle that developed when five Merseyside dockworkers were fired for refusing to work overtime with no pay, and gained the support of co-workers who wouldn't cross their picket line. As a result, those who stood in solidarity with the original five were sacked as well--500 in total--leading to a two-year stand-off. Co-written by award-winning screenwriters Jimmy McGovern (Cracker) and Irvine Welsh (Trainspotting), the two-year ordeal is brought home with startling reality, not least because of the contribution of the real-life Liverpool dockers who helped develop the script in extensive writing workshops, lending the film an authenticity it might have otherwise lacked. While the narrative hangs around the moving central story of one family in which both father and son are caught up in the strike, dramatic conflicts develop on multiple levels: between father and son; between the families of the sacked workers (this is particularly well realised as one long-time friend, played by The Royle Family's Ricky Tomlinson, turns scab); and between the workers and the union that betrays them. Ken Stott and Crissy Rock (Ladybird, Ladybird) are outstanding as the central working-class couple, old before their time at 47, and if nothing else, the film reveals one further reason why Liverpool loved Robbie Fowler quite so ferociously: during post-goal celebrations, Fowler lifts his jersey to reveal a T-shirt emblazoned with a message of support for the wronged dockers, ensuring national attention for the action at a time when all hope seemed lost. I'll look out for the DVD which I don't recall seeing before. 'Another World is Possible: How the Liverpool Dockers Launched a Global Movement' is a 2004 pamphlet published by the Radical Anthropology Group which puts on record a selection of perspectives as recalled by members of the London Support Group. It contains some further reading at the end. John Pilger's article 'They'll never walk alone' and some more contemporary material.